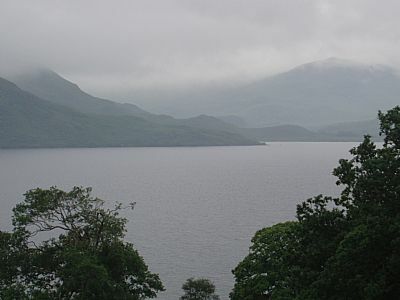 Loch Morar is on the west coast of Scotland, not far from Loch Ness. It's the deepest inland water loch or lake in the UK at 310m deep. It has had a long history of monster sightings similar to Loch Ness - the Loch Morar 'monster' is affectionately known as Morag. The first recorded sighting of Morag was in 1887, while in 1948 nine people in a boat reported that they saw a 20ft-long creature in the loch. The greatest excitement came in 1969 when two men claimed to have accidentally hit Morag with their boat. The poor creature is said to have disappeared after one of the men hit it with an oar while his companion opened fire with a rifle! If you want to know more about the history of Morag and Loch Morar, try to find a copy of 'The Search for Morag' by Elizabeth Montgomery Campbell which was published in the 1950s. 18th July 2013 - Scott Justice of East Kilbride took what are probably the first ever proven photos of Morag. He takes up the story……” It was at 1.45PM - my wife and I were both sitting at the front of Swordlands Lodge at Loch Morar having a picnic having walked the 5 miles or so having parked the car at the end of the road at Bracora when my wife spotted something in the water near the shore at Meoble Bay. It zig zagged for a couple of minutes near the shoreline before disappearing. It just suddenly seemed to appear….it was too far away unfortunately to see it clearly enough- I wish I had taken a better camera or even my binoculars to get a better view. We watched the water for another 20 minutes or so but didn't see anything else unusual.” One picture was taken after the object had disappeared confirming it wasn't a rock. You can see the picture here - it's in the far distance, just off the headland.